The Odin Mainland is separated into four countries, in each lives a group of soul masters protecting their county with their soul powers. The most powerful seven of them are known as Noble Lords. The story begins in the water origin, the Aslan Empire. Qi Ling (Cheney Chen) has been a busboy in an inn since young and subconsciously tamed a legendary soul beast, Ice Fang in a battle between soul masters. 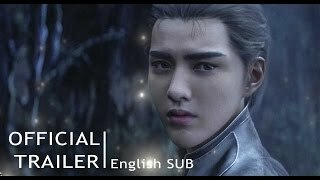 Yin Chen (Kris Wu) came on orders of the Silver Priest (Roy Wang) to take him in as his disciple. With his help, Qi Ling heads to the Grave of the Souls to seek his soul weapon, yet as he couldn’t sit still like how his lord instructed him; he enters the Grave of the Souls with Tianshu You Hua (Lin Yun) and Guishan Lian Quan (Fan Bingbing). Qi Ling thus become embroiled in the upcoming storm; a battle of soul powers between the lords.